Viola Beauty: Mini Target Beauty Haul: EOS, e.l.f, Revlon, & Wet n' Wild! Mini Target Beauty Haul: EOS, e.l.f, Revlon, & Wet n' Wild! I recently visited Target for some therapeutic shopping (ha!) because I was on the hunt for the new EOS Alice in Wonderland lip balm collection and managed to find it along with some other goodies! I really enjoy EOS lip balms; they are smooth, 95% organic, and work well to moisturize my lips. I use them before applying lipstick or lip stain and before I go to bed. I've tried several of the permanent lip balms and always keep one by my makeup vanity, bedside, and in my purse. Their egg shape and bright colors make them appealing to carry around and use. I also picked up a polish from the new Fergie for Wet n' Wild collection. This particular shade is called Glamorous, and I plan to use it for layering over polishes as it is a clear polish with large chunks of gold glitter in it. Since I've been enjoying the two shades that I picked out from the new Revlon Colorstay line, I figured I'd pick up one more. I've had my eye on this one for a while, since I need a dark teal to add to my collection. I like that it isn't too dark that it would appear black-like on the nails, and I'm excited to use it during the Fall. The shade is called Midnight. From what I've seen so far, it isn't very dense, but the hairs aren't sparse either. It should work fairly well in the crease for softer application and for less than $2, I'm pretty happy with it. Going along with the theme of having multiple eye brushes so I don't have to wash them as often, I picked up 3 new e.l.f. 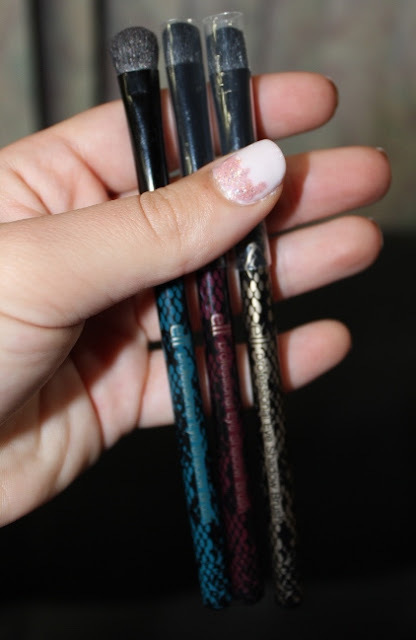 eyeshadow brushes! E.l.f. 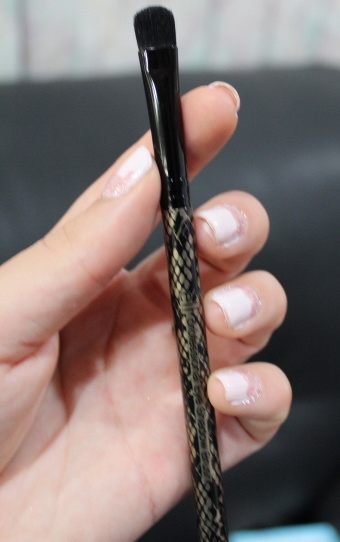 has come out with a new snakeskin print collection for Fall and the only thing that really appealed to me were these flat eyeshadow brushes. 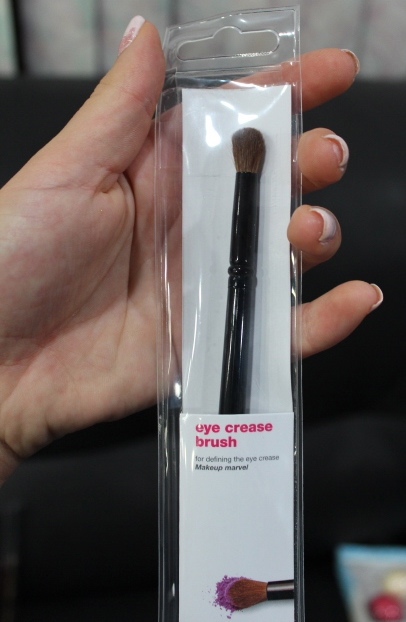 (You can never have enough of this kind of brush!) I like that these are flat and have the traditional "C" shape as they are perfect for packing on color. The colors they have are blue, dark red, and gold; all in snakeskin print. From the side, you can see that the bristles are fairly dense. I've used one of them a few times this week and really enjoy the quality. 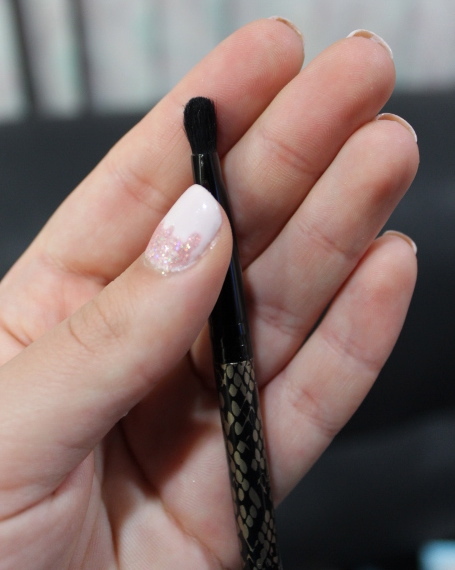 They're like a better version of their $1 eyeshadow brush!